Your heart is a marvel of nature that pumps life-giving, oxygen-rich blood throughout the body for use by every cell. Upon use by the body, the heart returns the oxygen-depleted blood to the lungs, where it receives more oxygen, to again be pumped throughout the body. The pumping action of the heart is controlled by coordinated electrical signals, or impulses, in the heart. Heart arrhythmias are irregular heartbeats caused by irregular electrical impulses in the heart. Atrial fibrillation is the most common of these heart or cardiac arrhythmias. You can find out more information about cardiac arrhythmias at the American Heart Association website. When your heart works smoothly, you hardly notice it. But when something goes wrong, it can consume you because of the potential impact on your life. Let's look at how the heart normally works. The heart is a pump, and is composed of two upper chambers, the right atrium and the left atrium, and two lower chambers, the right ventricle and the left ventricle. Oxygen-depleted blood returns from the body via veins (superior vena cava and inferior vena cava), and fills up the right atrium with blood. At the same time, oxygen-enriched blood returns from the lungs via pulmonary veins, and fills up the left atrium with blood. The heart's natural pacemaker (sinoatrial node, or S-A node) then fires electrical impulses that cause both atria to contract and push the blood down into both ventricles. These electrical signals continue down the heart (atrioventricular node, or A-V node) and through special pathways, causing both ventricles to contract — blood from the right ventricle goes into the pulmonary artery for transport to the lungs to pick up oxygen, and blood from the left ventricle goes into the aorta for distributing oxygen-rich blood to the rest of the body. This entire process, called the cardiac cycle, relies on coordinated electrical signals. This all happens in a single heartbeat, with this entire cycle normally happening 60–100 times per minute. 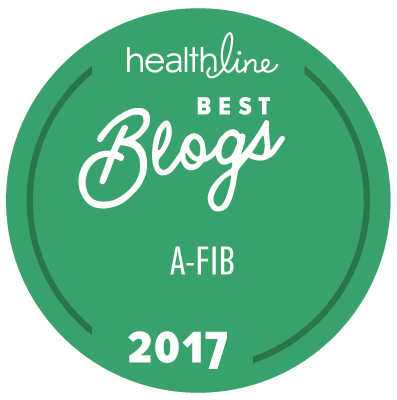 What Happens When the Heart is in Atrial Fibrillation? When this choreographed process doesn't work smoothly, you have problems. Atrial fibrillation happens when erratic or extra electrical signals throw off the normal timing of the heart's pacemaker, causing the heart to beat faster or just quiver. When the heart quivers instead of contracting rhythmically, blood can pool in the atria, and form blood clots. Excessive or irregular heartbeats can also overwork the heart muscle, leading to heart failure. Where Do These Signals Come From? Research has found that many of the electrical signals that cause atrial fibrillation start in the four pulmonary veins that carry blood from the lungs to the left atrium. This appears to be the case with most intermittent afib, which is called paroxysmal atrial fibrillation. Thus, treatments for afib generally focus on stopping the passage of these erratic impulses from the pulmonary veins into the left atrium. Current catheter ablation and surgical ablation procedures, such as the maze procedure and mini maze procedure, focus on isolating the pulmonary veins from the left atrium using various energy sources to cut off conduction between them. It is now believed that networks of nerve cells, called glanglonic plexi, may contribute to or initiate these irregular electronic impulses, and current treatments now include ablation of glanglonic plexi to eliminate atrial fibrillation. To watch a video that discusses recent research into the relationship of sleep apnea and these ganglionic plexi ("the third fat pad"), see Noted Electrophysiologist and Ablation Pioneer Discusses New Findings About Atrial Fibrillation and Obstructive Sleep Apnea. For more information about the causes of irregular heartbeats and other atrial fibrillation symptoms, see What Causes Atrial Fibrillation?